custom designs the most energy efficient refrigeration systems available today. The cold Control compressor rack consists of a series of parallel piped compressors mounted on a heavy duty steel frame which is custom designed and built to each customer's individual needs. 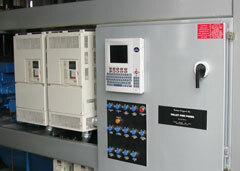 The compressors are controlled by variable frequency drives (VFD's) which allow them to operate between 600 and 1800 RPM. The compressors spend the majority of their time operating between 50 and 85% of full speed which drastically reduces the amount of energy that they consume. 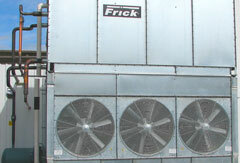 Another benefit of the Cold Control system is seen when the electric motors are started. The VFD's will bring the motors up to speed very slowly, consequently, there is no instantaneous energy demand, or spike. The utility company's charge extra fees for these spikes in the form of "Peak Demand" charges. The Cold Control refrigeration racks are pre-manufactured with all of the necessary systems installed, thus, when they arrive at the job they only require final electrical and mechanical hookup. The Cold Control refrigeration system will come with either an air, or water-cooled, condensing unit which would typically be placed next to the mechanical room. The condenser motor is also controlled with a VFD which will operate the motor between 600 and 1800 RPMs to maintain a minimum discharge pressure point. The condenser motors spend the majority of their time operating between 50 and 85% of full speed, which drastically reduces the amount of energy that they consume. 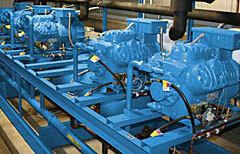 The refrigeration control panel is the heart of the system. It includes the microprocessor based refrigeration controller, main power distribution block with disconnect switch, compressor circuit breakers, condenser and evaporator fan circuit breakers, control switches, indicator lights, fuses, and control relays. 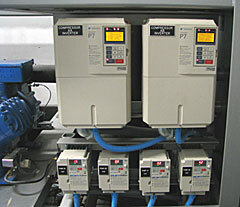 The Variable Frequency drives can be factory mounted on the refrigeration rack or remotely mounted on the mechanical room wall. The Cold Control refrigeration system features the CPC Einstein-II RX- 300 controller. The Einstein II controller is capable of monitoring and controlling virtually every function of the refrigeration system. Additionally, the Einstein uses the RS485 I/O network which will allow remote communications from anywhere in the world via the internet. Contact Cold Air Refrigeration today for your cold storage needs!